We use specialised high production machines. These world class machines feature the best technology available for the manufacture of wire fencing products. Angas Fencing source raw materials from wire mills locally and worldwide, ensuring continuity of supply and consistent quality. Our suppliers are the best in the world, only supplying raw materials that comply with Australian Standards AS 2423-2002 stringent quality assured standards. State of the art test equipment is used to ensure accurate tensility of every coil of wire used. This quality operating procedure combined with close attention to the detail of the manufacturing process confidently ensures Angas Fencing supplies a well-made, long lasting fence for the tough Australian conditions. Angas Fencing, to ensure an adequate supply to the requirements of its resellers, warehouse finished manufactured stock at the Wetherill Park factory. 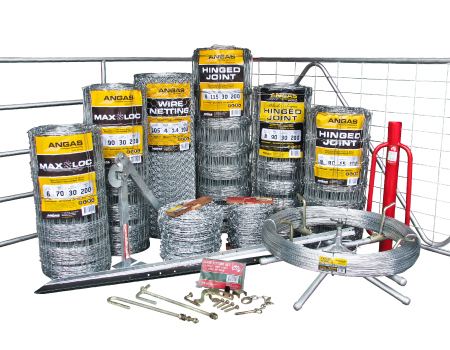 Angas Fencing products are only distributed through Australian rural resellers. Angas Fencing does not supply to non bonafide resellers.